The GFFAF is back! This year at the Expo center. I’m sooo excited for the new venue. I’ll be speaking from 12:10-12:50 both Saturday October 1st and Sunday October 2nd on How to Maximize your Energy on a Gluten-free Diet. 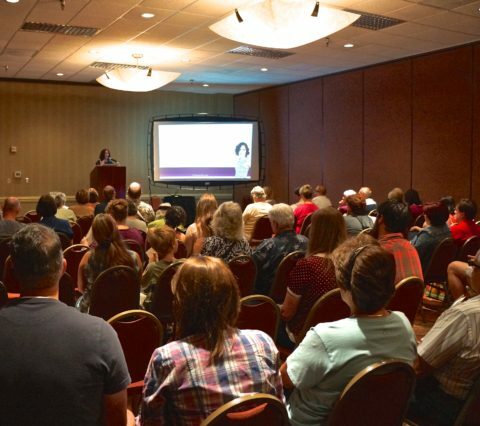 There are many other fabulous speakers and endless booths with yummy samples and great information for your gluten-free life. The expo is great for people who have been GF or who are just dipping their toes in. Come see me at my table and introduce yourself! 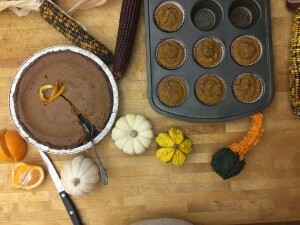 Gluten-free, Paleo, or Vegan Thanksgiving Delivered to Your Doorstep!! 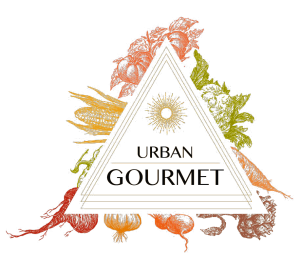 A few months ago I had the opportunity to try Chef Ryan Abitz’s paleo delivery service, Urban Gourmet. It was most excellent and I recommend it all the time. 100% GF (celiac dedicated commercial kitchen,) DF and accommodating of other allergies to boot. I thought just for fun I’d email him to see if he was doing a menu for the holidays and BAM! Yes indeed. Thanksgiving, handled. His prices are ridiculously reasonable and I can tell you that he’s yet to have me try anything that I didn’t adore. Wait, did I tell you he’s delivering said Thanksgiving meals? As in to your house? When I asked him about the details he also let me know that even for Thanksgiving he can accommodate your allergy or special dietary needs and requests. PS Full disclosure Ryan sometimes offers me discounts on food because I shout for him and send him new clients. I’d do it no matter what though. Because, you know, shouting about gluten-free yum is part of my job. 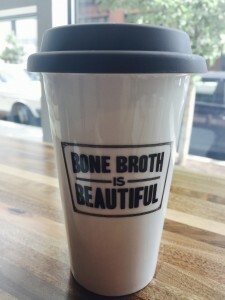 Oh my gosh you guys, if you have not yet experienced the new Broth Bar by Salt, Fire, & Time in NE Portland, quick, get out your to-do list and add a trip to this yummy haven of nourishment! 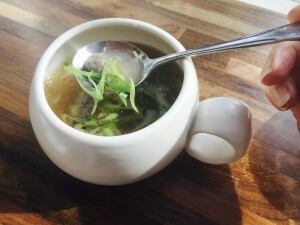 Before I share my broth bar adventure, I want to reassure you, everything at Broth Bar is gluten free! Rosemary Salt, Grated Ginger, Scallions, & Chicken Hearts. I LOVED the broth with the bundle but I’m on the fence with the Dandy Blend but am not giving up on it. Again, I couldn’t leave without some goodies to take home so I got a to-go cup of pork broth with the simple stir in of Grated Turmeric – YUM, some more Galactic Hog Skins, Wild Zora Bars, housemade Gomashio, and more! I just love this place, it’s going to be my go to place to meet friends and great to pick up gifts for new moms, those that are sick or in recovery, etc. There really is something for everyone too- besides broth and the items I listed, there is kombucha on tap & to go in bottles, tea, truffles, some New Cascadia gluten-free baked goods, local cheese, pasture raised eggs, fresh coconut yogurt, freshly made mayonnaise, and more! I seriously am daydreaming about going back! But I make my own bone broth you say! Well, so do I! I use it for soups and stews, for cooking, etc. but I don’t have all those varieties and when I want to meet a friend or grab a quick bite to eat while I’m out and about Portland, I think this place is simply amazing for that! 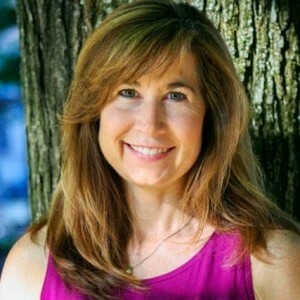 Holly Morelllo is a Certified Nutritional Therapy Practitioner, nutrition writer, motivator, wife, and mom of 3 amazing spirited sons. Her passion is to inspire and motivate others to achieve optimal health and vitality through education and targeted nutrition and lifestyle programs. Follow Holly on Instagram & Twitter @nourishingholly. Her website and blog can be found here. 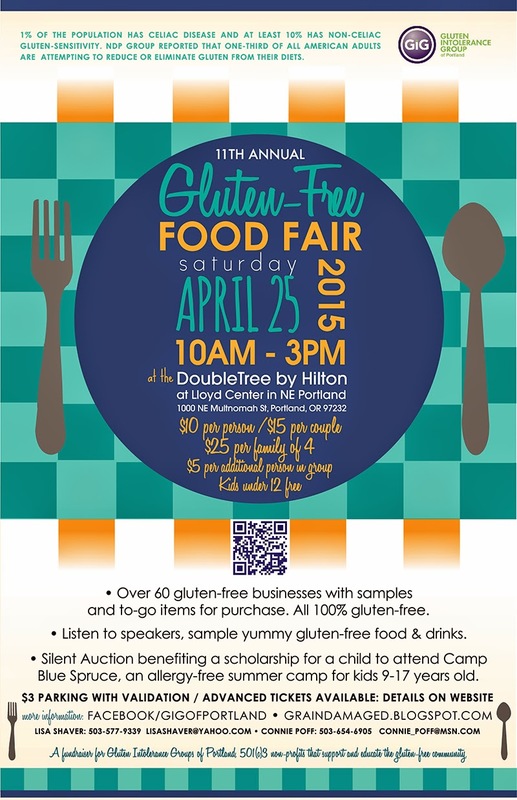 Gluten-free Food and Allergy Fest PDX! 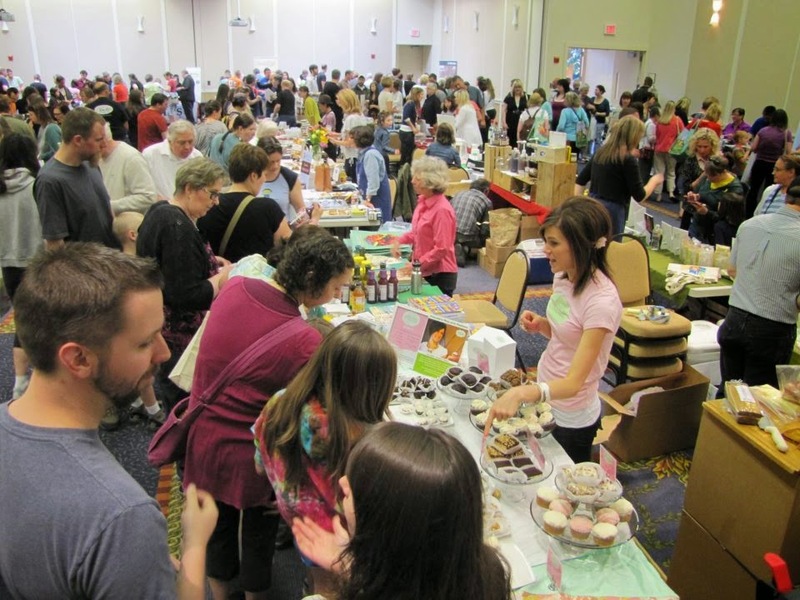 So excited for the Gluten Free & More (used to be Living Without) Expo this weekend. There will be a ton of local and national vendors with yummy treats and samples. TICKETS: click here. They are also available at the door. I have $5 off coupons at my office, feel free to swing by and pick them up! I’ll be speaking again this year. 12:50-01:50 pm – Sueson Vess – Eat.Real.Food. & Eat.Real.Dessert. 11:40-12:40 pm – Sueson Vess – Eat.Real.Food. & Eat.Real.Dessert. I’ll be at a table all day too. Come say hi. 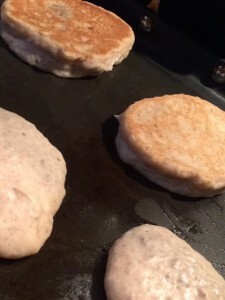 My husband and my eight-year-old are the pancake people in my house so I had them do the cooking and taste test when Eric and Triann sent me a bag of pancakes to try out! Overall they called it a thumbs up. The recipe was simple as you only need to add oil and water, great for a weekend morning when we were excited to get out of the house to kick the soccer ball around. The color was good and they didn’t burn when they crisped up. I thought the taste and texture was more like a scone or dense doughnut, which was yummy but not my preference for pancakes. That’s strictly personal though. My 8-year-old loved the doughy texture and sweet taste. Overa ll a thumbs up. Thanks Eric and Triann for sending it. We’re looking forward to adding it into our rotation. PS I got a chance to connect with these guys again at the GIG fair this week and realized that we never hit “publish” on this post when we wrote it months ago! Apologies to the folks over at Triann Pantry. I’m looking forward to trying the other bags of mix they gave me this weekend. Over 60 gluten-free businesses with 85% locally owned businesses. Supporting the local GF community! Please SHARE with family and friends and spread the word! This is GIG of Portland‘s fund raising event for the year. 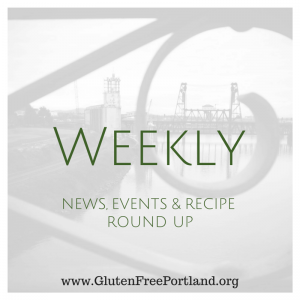 We are a non-profit 501(c)3 to educate, reach out and support the gluten-free community in Portland. 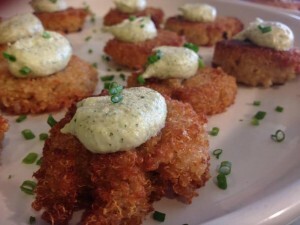 Ok my idea is to start posting a weekly roundup of upcoming local events, general news, and recipes. It may turn into every other week but I’m hopeful that I can get this into rotation. Let me know what you think and if there is anything you’d like to see here. Can Better Biopsy Practices Diagnose More Children? GIG Fair April Saturday April 25th. I’ll be speaking, so will a number of other local docs, we’ll keep you posted on deets! 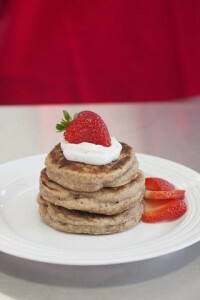 Gluten-free Food and Allergy Fest September 26-27 by Gluten-free & More Magazine. I’ll be presenting here as well, along with a number of other local folks: Laura B Russell, Kyra Bussanich, Allison Jones and more…we’ll keep you posted as more info comes in. The third this winter of Zach’s Bistro (Newport) winemakers, brewers and distillers dinners series is GF and coming up next weekend! When they were searching for a good gluten free beer to offer in the restaurant they didn’t have to look far. Guess who? Our own gluten-free PDX Ground Breaker Brewing. James Neumeister will be joining in for the meal and festivities. $55 per person inclusive without gratuity. ***Attendees of the brewers dinner will get 20% off their stay when they book their lodging at Elizabeth Street Inn. Not valid on Thursday, February 12th, Friday February 13th, or Saturday, February 14th.What a great reason to book a getaway to the coast! New from Portland Monthly: The Balance! When Allison Jones (see bio at end of post) told me that she was starting a new health blog for Portland Monthly I offered right away to feature it, and her, on GFP. 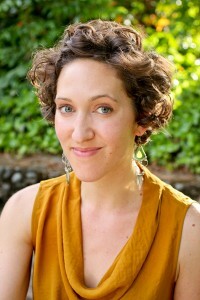 She’s gluten-free herself and has been the editor of PoMo’s Eat Beat for years. She knows this city’s GF scene inside and out. What she has to say is worth listening to. You can sign up for The Balance to be delivered directly to your inbox here! The Balance is PoMo’s new health blog where I’ll be sharing health trends, monthly wellness event calendars, health tips from local fitness pros, the best healthy restaurant deals in PDX, workout ideas and gym spotlights, and plenty of contests and gear giveaways to keep my readers plugged in to the world of wellness. 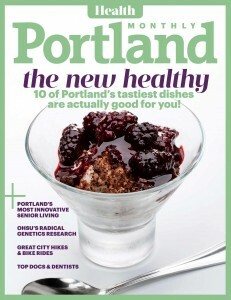 It’s the first resource of its kind in Portland—a PDX-centric look at all things healthy—and I’m so excited. What’s your personal health journey? I was born with hip dysplasia, a genetic disease that keeps me from a lot of my favorite activities like running and sports, but I’m definitely an athlete at heart. I’m very passionate about finding workouts that fit my body’s capabilities, which has lead me to a passion for yoga, hiking, and swimming. I’m always looking for new ways to move—I currently have a crush on gyrokinesis classes and stand-up paddleboarding. On the food side of things, I discovered a few years ago that giving up gluten, dairy, and processed foods made the arthritis in my hip so much better, soI went Paleo and never looked back! 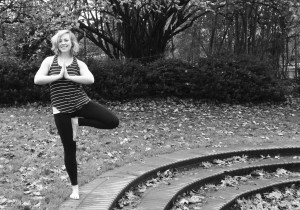 I’m presently in training to become a yoga teacher and would love to help other folks with physical limitations find a method of movement that fires them up! The Balance feels like a great way to reach out to people who are already passionate about fitness and health and those who think it might not be for them. Trust me—and my creaky hips—this stuff is for everybody! What can we expect from The Balance? Everything from the best gluten-free brunches in Portland to new zip-line parks, bike-centric physical therapy, cool athletic shoe and sports bra innovations from Portland companies, healthy recipes from chefs and cookbook authors, gym deals, practical yoga poses for everything from hangovers to lower back pain, fitness- themed board games for kids, and insider tips from health experts specializing in fertility, weight loss, acupuncture, running, and more. 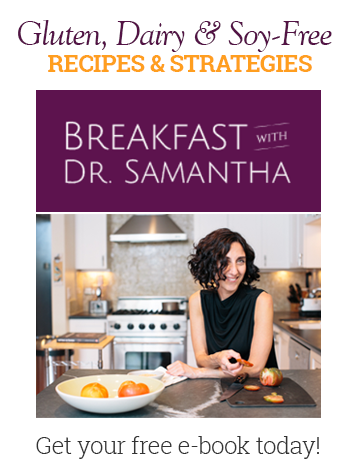 I’m always looking for new ideas, so feel free to shoot me an email at ajones@pdxmonthly.com with any health events, requests, and questions for our own house ND, Dr. Samantha of Gluten Free Portland!